British manufacturer, Renderplas, has supplied over 38km of PVC external render beads for the magnificent multi-billion dollar Wynn Palace resort in Macau, widely known as the ‘Las Vegas of China’. Stop and corner beads from the Renderplas range have been used throughout the construction of the spectacular 29-storey resort, which boasts a beautiful lake with dancing fountains and Golden Dragon statues to welcome guests upon arrival. Inside, Wynn Palace includes a lavish hotel with more than 1,700 rooms and suites, a large casino, and a choice of luxury retail and dining venues. Specified in classic Ivory, the Renderplas PVC beads complement the resort’s gleaming rendered façade and create a perfect, long lasting finish that will stand the test of time. Manufactured from recycled exterior grade, impact resistant, UV stable plastic, the Renderplas range offers a robust, cost-effective solution that is guaranteed not to stain or corrode over time like galvanised steel beads – making it the ideal choice for a world-class resort like Wynn Palace. Additionally, because Renderplas beads are manufactured in PVC, rather than metal, they are easy to handle, transport and resilient to damage. 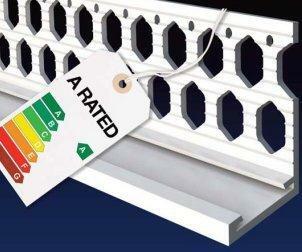 This all adds up to less waste, and makes them simple and safe to cut and install on site. Strong and maintenance free, Renderplas PVC beads offer developers and contractors a winning combination of aesthetic appeal, durability and ease of installation. Stop beads for Wynn Palace were specified in three sizes to suit different render depths across the building complex, ranging from 10mm to 20mm. The beads provide a clean, crisp finish and an impact-resistant reinforced edge to the render at door frames, windows reveals and at changes to materials used in the façade. Renderplas corner beads, in the same range of sizes, were installed at Wynn Palace to form sharp, reinforced corners in external rendering so the immaculately straight lines would stay strong and look great for the entire life of the render.